The fear of the unknown may possibly one of the biggest fears that children have. Those who have never yet set foot in a dentist (though they should from their first tooth) are those who fear having their teeth looked at. It’s not something they’re excited about, but it’s a necessary step to take for the sake of their oral health. Some of the time, children fear it because their parents fear it, and it’s up to parents everywhere not to pass on their fear and show children that it’s a place that is helpful and fun! 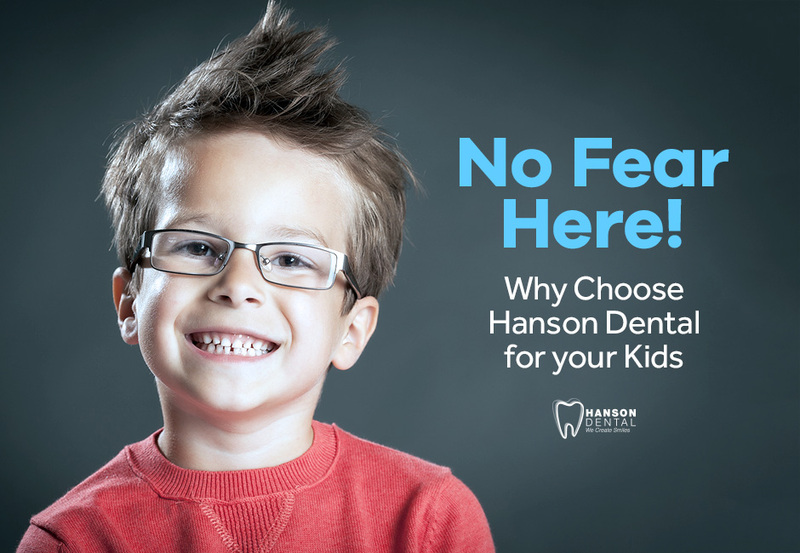 Hanson Dental is the place to go for children’s dentistry. Our dentists completely understand that children are going to fear getting their teeth looked at and we are all about making things relaxed for children. We go the extra mile for them, with the express concern about their dental health and keeping them calm and relaxed throughout any dental appointment. Hanson Dental are committed to the best children’s dentistry in the Buffalo area. We know that parents need their children to feel excited about getting their teeth looked at, but the feeling of being out of control is what makes children cry. Not at Hanson Dental. We make more effort than most places to help children to feel comfortable and in control as much as possible.Do you know what doesn’t make children cry at the dentist? A TV/DVD player built into the ceiling so that they can watch their favorite show during a procedure. A dedicated room dedicated to the little ones to help them to reduce their fear. Digital x-rays that can minimize the exposure to radiation by 90%. We put children and their comfort at the forefront of our minds, which is also why we offer a child-friendly fluoride treatment that means that they will no longer have to wait to eat or drink after a procedure. We make a point of identifying problems with children’s teeth as early as possible and we are able to identify whether thumb-sucking, tongue-thrusting and jaw-clenching factor in to why their teeth may be having trouble. At Hanson Dental, we want children to feel confident about their dental health, and it’s why we want them to grow with us. We assess their facial growth, the spaces between their teeth, overcrowding as adult teeth grow through and whether there are extra teeth growing. We want you to feel comfortable and confident that we can offer the best in orthodontics, and that we will take note about your child’s teeth as early as possible to make corrections that are necessary. Hanson Dental want to be there for your family every step of the way, from the first tooth through adulthood! Make us a priority in your child’s health, and they never need to fear going to the dentist ever again. How Can Cone Beam Technology Help You?